There’s no better way to protect your equipment investment than using covered storage when a machine is not in use. Inclement weather, freezing temperatures and sunlight can ruin equipment or at the very least, dramatically reduce its resale value. Rushmore Buildings are engineered to withstand the most severe weather and the strong fabric cover provides superior protection from harmful UV rays of direct sunlight. Our variety of sizes and configurations make Rushmore Buildings the ideal and affordable way to store virtually any type of vehicles and equipment. Rushmore Buildings are built to sit on the exterior walls offering an interior space that is completely open and column-free. This allows you to fit more inside compared to traditional buildings and makes accessing equipment easier. For even more savings, our a woven, high-density polyethylene-coated cover allows natural light to enter reducing electrical cost. Easy to erect, easy to relocate and easy to expand. 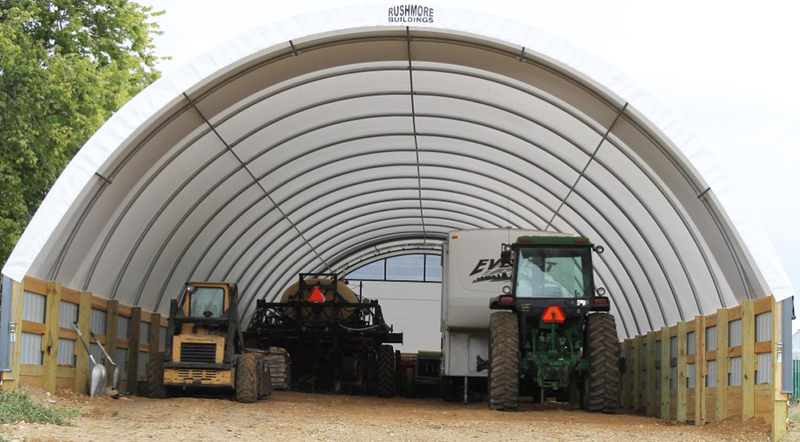 Rushmore machine storage buildings are designed to provide the highest level of protection and usability. They require no painting or shingling and the steel structure is zinc-coated to provide years of hassle-free use. If your need for storage grows, our buildings are simple to add on to, reconfigure or relocate so they always provide the ideal solution for your needs. Call us today at 1-866-776-5617 or your free estimate. Low cost per square foot.